For my previous post on Jean Piaget’s theory of cognitive development, click here. As with my previous post, I will explain a little about Vygotsky and his life before we look at his theory. Born in Orsha, a part of the Russian Empire (now known as Belarus) on 17th November 1896, Vygotsky was a pioneer of psychology; he contributed much important research to the field. He graduated from the Moscow State University in 1917, and went on to work in many research facilities and and educational establishments in Moscow, Leningrad and Kharkov. His extensive research into cognitive development has lead his theory to be one of the most important of it’s kind. He believed that children’s thinking is affected by their social knowledge, which are communicated by either psychological (language, number, art) or technical (books, calculator) means. He was – and sometimes still is – often criticised for being an idealist and his overemphasis of the role of language in thinking (more on the criticisms later). He was also a very popular author, with 6 volumes of his work being classed as major. Vygotsky rarely conducted research; he was more focused on constructing the best possible theory on the transfer of knowledge. Unfortunately, Vygotsky died at the very young age of 37 in 1934 from Tuberculosis, but once his main work was translated to English in 1962, it had a major impact on other psychological research in similar fields. Vygotsky’s theory of cognitive development. As stated above, Vygotsky believed children’s thinking is affected by their knowledge of the social community (which is learnt from either technical or psychological cultural tools). He also suggested that language is the most important tool for gaining this social knowledge; the child can be taught this from other people via language. He defined intelligence as “the capacity to learn from instruction”, which emphasises the fact there is a requirement for a more knowledgable other person or ‘teacher’. He referred to them as just that: the More Knowledgable Other (MKO). MKO’s can be parents, adults, teachers, coaches, experts/professionals – but also things you might not first expect, such as children, friends and computers. Level 1 – the ‘present level of development’. This describes what the child is capable of doing without any help from others. Level 2 – the ‘potential level of development’. This means what the child could potentially be capable of with help from other people or ‘teachers’. The gap between level 1 and 2 (the present and potential development) is what Vygotsky described as this zone of proximal development. He believed that through help from other, more knowledgable people, the child can potentially gain knowledge already held by them. However, the knowledge must be appropriate for the child’s level of comprehension. Anything that is too complicated for the child to learn that isn’t in their ZPD cannot be learnt at all until there is a shift in the ZPD. When a child does attain their potential, this shift occurs and the child can continue learning more complex, higher level material. Diagram to demonstrate the ZPD. Another important feature of this theory is scaffolding. When an adult provides support for a child, they will adjust the amount of help they give depending on their progress. For example, a child learning to walk might at first have both their hands held and pulled upwards. As they learn to support their own weight, the mother might hold both their hands loosely. Then she might just hold one hand, then eventually nothing. This progression of different levels of help is scaffolding. It draws parallels from real scaffolding for buildings; it is used as a support for construction of new material (the skill/information to be learnt) and then removed once the building is complete (the skill/information has been learnt). After the session, the child was assessed on whether they could construct the pyramid on their own. Results showed that when children were given varied support from mothers (low levels of support when the child was doing well, and high levels when the child struggled) they were able to construct the pyramid on their own. However, when the mother consistently provided the same support, they seemed to make the child conclude the activity was beyond their comprehension and the child soon lost interest in constructing the pyramid. This shows the importance of providing the correct level of scaffolding when teaching a learner. The Woods & Middleton (1975) pyramid puzzle. As a final point, Vygotsky looked at the role of egocentric/private speech. This is, for example, when a child will sit on their own and speak their thoughts out loud as they play. He suggested a child is regulating and planning their behaviour at this point: “Where is the block? I can’t find it. Oh well, I’ll use this block.” He called these ‘monologues’. By 7 years, these monologues become internalised and the child becomes a “verbal thinker”, which is what most adults can do with no problem. When we are faced with a problem, and we’re alone, we quite often think through the problem – but in our heads. Children before 7 will do this out loud. This verbal thinking forms the basis for higher level, more abstract thinking (planning, reasoning, memorising, evaluating). Emphasised the role of a teacher in cognitive development, and the need to have support from a More Knowledgable Other, or MKO. 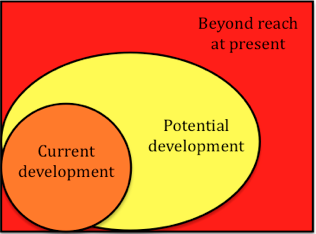 The zone of proximal development, or ZPD, differentiates between a learner’s current development and their potential development when being taught from a MKO. Scaffolding provides an effective way to reach potential levels of development, but only when different levels of assistance are given when required. Social and cultural tools are an important means of gaining intelligence. Internalising monologues, and therefore becoming a verbal thinker, is a stepping stone to higher levels of thinking. Vygotsky provided a very influential theory which provided a meaningful social context in the development of learning. The emphasis of cultural knowledge was something unseen in Piaget’s theory. In the next post, I will be evaluating both of the cognitive theories (that of Jean Piaget and Lev Vygotsky) and then comparing and evaluating them against each other. Entry filed under: Cognitive, Developmental. Tags: Children, Development, Vygotsky. Effect size for Analysis of Variance (ANOVA)	NEW: Subscriber only posts. Dear Sam can you please tell me in which book you found the Zone of Proximal Development diagram!! I made the diagram myself in Microsoft Word! If you wish to use it then please feel free to download a copy of the image. U just made my day!thanks a lot, I actually understand more about all of this thanks to u.
I’m so pleased to hear this article has made a difference! dear Sam, informaition you provide is usefull. big up! Thanks for your compliment, it’s much appreciated! That was very helpful! Thanks so much! I appreciate it! I am pleased to have this article on Vygotky’s theory. A step a head to me as a scholar. Thanks for your kind words, I’m glad the article has achieved it’s academic purpose. hi, do you know if someone has done a current research about Vygotsky’s theory of cognitive development? I’ve not particularly looked into it to be honest, but try exploring psychology research databases (if you’re at Uni). There’s bound to be a plethora of research into his theory from the past few years. I’m glad the article has helped. Thank you Sam for this page; it helps me a lot to prepare my lesson for tomorrow. Just needs further explanation for the implication of his theory for teachers. Hi there, I’m glad the article has helped! Thanks also for the ideas for improvement, perhaps when I have more time I’ll edit the post to include more about implications for education. Found your article to be very informative and reader friendly. Has helped me to gain a clearer understanding of Vygotsky’s theory; esp the zone of proximal development. Thank you. Hi Sam, your article is very informative. Can i reference it for my assignment? Of course you can, that’s absolutely fine! the article is profound. please may i know in which work of Vygotsky is the ZPD spoken of. Sam–great Work, is it possible to reference or present your sources? to say that this article sucked means you either have 3 PhD’s or you did not understand a single word. sam, can you tell what book do you use for vygotsky theories? ?i really need know what your sources for my assignment, please…. Hi there! I tend to use University lecture slides as opposed to books. I’d recommend finding any decent book on Child Psychology – it’ll definitely have both Piaget and Vygotsky in! This really helps me accomplish my assignments..great! I’m glad to hear that! Good luck with your studies. Clear, concise and not boring at all. I am delighted to have stumbled upon this page which also led me to your post on Piaget. Your writing has certainly helped me to gain a clearer understanding of these two theorists and for that I am very grateful. Thank you. your compiled work is inspirational. i’m glad to ‘ve read it.the theory is presented in such a simple way that even a beginner can understand it without further explanation by a teacher or expert. Dear Sam, I am very happy to find your link and read your explanations in simple terms. Thank you, I will keep reading you. But could you please tell me if you know people dealing with the influence of the MKOs’ attitude in language teaching and learning? If not, could I use it as a research topic? Thanks Sam this helped me a lot when doing my assignment. Hi sam.. This article is excellent n of great help. Loving it more. Workdone, this document is reach in tangible facts in as far as the intellectual developments takes place in infants up until they develop to adulthoods. The role of culture and socialization plays funtamental contributions to cognitive development in real life situations. By so this theory the base for cognitive development since many psychologists try to reason around Vygosky’s work thereby come with other versions. I appreciate this kind of research.